This sermon was delivered on 9/23 at Wallace United Methodist Church. 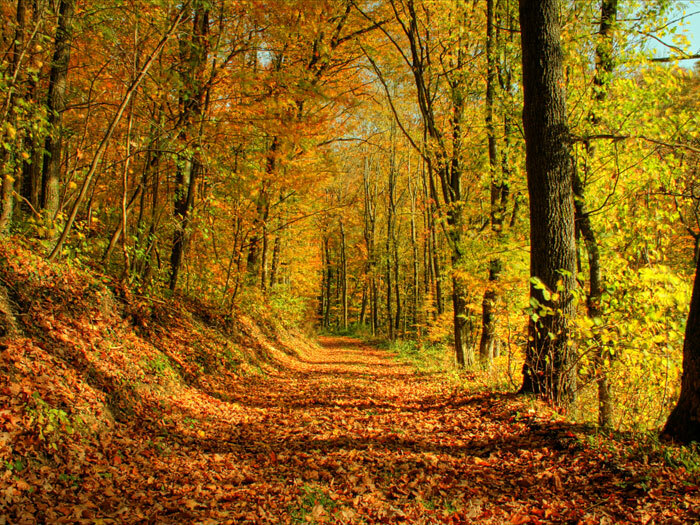 Fall is, quite possibly, my favorite season. The weather gets cooler. The leaves start changing color. The days get shorter. You get to start wearing jackets. Everything smells like pumpkin spice, for some reason or another. It’s absolutely wonderful. You can almost feel it in the air; the color of the whole world changes. So does the world itself, it seems. One of the things about fall is that it’s the traditional time for the harvest. Everyone starts thinking about hayrides, and farms, and all these things that deal with the earth. Everything seems more natural at this time of the year. And without fail, almost in every one of these “fall” decorations you see out there, is the image of a scarecrow. Scarecrows get me thinking, honestly, because what exactly is a scarecrow? It’s a decoy, isn’t it? It’s a distraction. It’s a human figure that’s not really a human, but a set of clothes stuffed with hay and made to look like a person—why? To literally scare crows, to scare the birds away from the ripened crops. Animals know that the food in the fields is getting ready to be picked and harvested, and so they want some of the food too. So people make these decoy people to make the birds and other animals think there’s people in the field, and so they won’t hopefully eat the food. There’s a long history of people using scarecrows; the use of scarecrows has gone on for centuries. 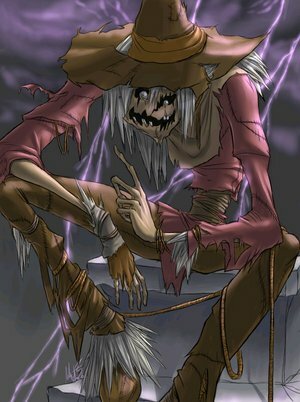 In almost every culture across the world, the scarecrow has been used; there are accounts of their use in Ancient Egypt, and there’s a manuscript coming from the 8th century Japan that use scarecrows in ancient folklore. It’s a nearly universal idea! And they’re all over our modern culture, too, even though not all of us are farmers. 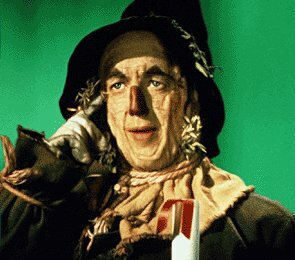 If you remember from the Wizard of Oz, the scarecrow was terrible at his job, because the crows had figured out he wasn’t really a threat, and throughout the story, the scarecrow wants a brain, so that he can be a person of substance and not just a straw man, filled with fluff and not much else. 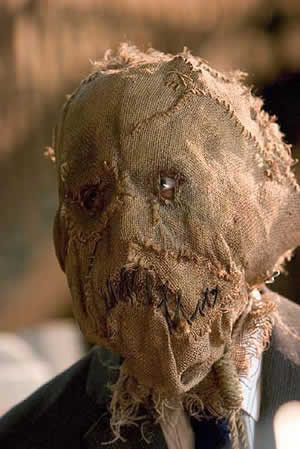 If you remember the Batman movie, Batman Begins, one of the villains is called the Scarecrow, and his whole thing is using a hallucigenic chemical, a drug, that makes people have horrible visions of things that aren’t really there, but terrifies them nonetheless. 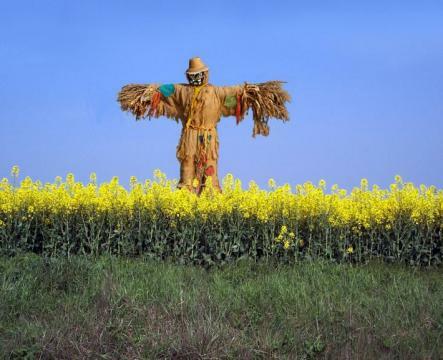 The thing about scarecrows is that they are, at their very basic, decoys. They’re lies. They are inanimate objects that appear to be something terrifying to the unsuspecting, something that could cause real damage and danger, but in reality, they are just made of straw and cloth. They represent a fear that lacks substance, that lacks reality. They’re for crows what monsters in the closet are to us. They appear scary, but are actually harmless. And really, that gets at a crucial aspect of fear, isn’t it? People fear things because it’s inherently irrational. It is, in fact, instinctual to have fear. Fear can be a very useful thing, though. It’s a matter of survival, in some cases—fear gives you the adrenaline boost so that you can say, I don’t know, run away from a charging wild animal. It can give you the strength to fend off an attacker. Fear can be indeed helpful, but in some cases, irrational fear can hold us back. We need to know when to be afraid, and when what we’re afraid of is just a scarecrow. It’s really bad though sometimes, because those scarecrows also have a way of winding up in our hearts. 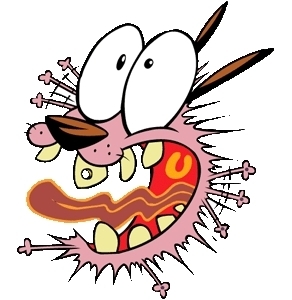 Something happens in our lives, and it triggers that irrational fear of something that happened to us in the past. Or something someone says puts us in an uncomfortable place, for reasons we can’t truly say, and we wind up acting irrationally because of it. Or even because of something someone says and we’re afraid because we know EXACTLY what it means. These are scarecrows in our hearts, and they really aren’t dangerous once you think about them hard enough, but fear kicks in and makes us afraid anyways. As Christians, we are called to go where Christ tells us to go, but more often than not, we’re afraid to go, or afraid to do it, or afraid to truly believe in what he tells us to. The story of the Bible is one that is filled with people that are afraid, but afraid for very good reasons. Abraham was afraid when he was told to leave his home and go to someplace that only God knew where it was. Moses was afraid of going back to Egypt to lead his people out of slavery. Jonah was so afraid of going to where God was telling him to go, he tried to run away to the far corner of the world! Fear fills those who are called by God for a special purpose, and the disciples are no different. They were afraid when Christ walked upon the water in the middle of the storm. They were also afraid when Christ was found sleeping in the middle of the storm on the lower deck of the boat! They were afraid so many times in the story of the Gospel, for many good reasons; physical danger beset them at all sides! But here, in this story, they are also afraid, but afraid for different reasons. Here, what they are afraid of are scarecrows in their hearts, decoys, fake monsters that prey on our irrational fears. Mark gives us this story as a series of teaching moments. Jesus is, after all, a wandering rabbi, and teaching is what he does best. So one thing we notice here is that Jesus and his disciples are walking through Galilee. If you remember, Jesus’s hometown of Nazareth, and most of his disciples, are from Galilee. So what we’re seeing here is that the crew here is wandering through home base, but they’re doing so secretly. And Jesus begins to tell them, now for the second time, that he, the Son of Man, is going to be betrayed, and killed, and then three days later rise again. Again, to us 2000 years after the story was written, this seems like fairly commonplace knowledge, but imagine for a second that you are a disciple here. Imagine that your friend, your teacher, your leader, the one you just saw a few days ago admit that he’s the son of God, who just a few days prior saw him transformed upon a mountain, who saw this man’s true glory and divine nature, indeed, saw your teacher appear to you as God. You just saw this happen. And here he goes again saying that he’s going to die. So the disciples here are justifiably confused. But at the same time, they are also afraid to ask Jesus anything. No clarification. No hard details. No why, no how, no nothing. They are afraid to ask him what he meant, and so they resigned themselves to confusion because they are afraid. It’s just like when you were back in school, and the teacher just taught you something really difficult, something that’s bound to be on the final exam. And you’re sitting there, and inside your head you’re going, “Holy moly, I have no idea what she’s talking about.” And so you sit there. And the teacher asks if there are any questions. And you just sit there, not saying anything, because you are afraid to look like you don’t get it, afraid of looking dumb, and afraid of everyone thinking that you’re dumb. The truth is, if you’re having problems with it, chances are everyone else is having problems with it too. But no, you sit there, and you can’t understand it, and you’re afraid to ask for help. This is what the disciples are doing, to some degree, but they’re doing it for another reason too. They’re afraid of understanding it because of what if might really mean for their movement; their leader is going to die. Period. He’s going to die, and they’re going to lose him, and there’s nothing they can do about it. So they’re afraid of accepting Christ’s death, something that any disciple of Christ needs to understand and accept. Thus, Jesus tears down the first scarecrow for the disciples’ hearts: the fear of asking questions, and the fear of Jesus’s death. Now then, they continued on their way down to Capernaum, and apparently they were arguing about something—probably quite loudly, I would expect. So much so that it catches Jesus’s attention, of course. And what else are they fighting about, but over who’s greater than the other? Really, you could relate this to their fear of asking questions we just talked about. The disciples had professed their belief that Jesus is the Messiah, the chosen one, the one who would lead Israel to peace and liberation—but in the way they expected, not the way that Jesus had just told them. They expected Jesus on a white horse, storming the gates of Jerusalem, not Jesus on a donkey, and certainly not Jesus dragging a cross to Calvary. Because they believe in Jesus on a white horse, Jesus the Conqueror, they begin to argue about who’s going to be the right hand man when Jesus is in charge. That’s the argument. Jesus hears it, and like the good teacher he is, he turns around, and simply, innocently, asks them what they are talking about. The disciples, of course, are silenced again. They’d been caught. I bet they felt pretty sheepish, pretty embarrassed about it, from the way they were silent. Jesus knew what they were talking about, and knew the secret fear that fueled the argument; they were afraid of the reality of Jesus death, yes, but they were also afraid of something else too, and this is the second scarecrow of the heart. The disciples were afraid of being powerless. They wanted a powerful messiah, because they were afraid of their own weakness, their own powerlessness. So Jesus, calmly, patiently, taught them this: That if they want to be greater, if they want to be powerful, they need to be the least, and to be servant of all. Jesus subverts their fear, and tears down the scarecrow in their hearts. They need to embrace their powerlessness, because in embracing their own lack of power, in becoming a servant of all, they become the most powerful, and the greatest. Giving up power means embracing true power. And so another scarecrow in their hearts is torn down and exposed. Finally, as he gives this lesson, he calls forward a child, and thoroughly blows away everyone’s expectations one more time. The only reason for an adult at this point in time in this culture is to tell a child something, or give them an order. Children were not thought of as they are today; they weren’t really full members of society, not until they were adults. But what does Jesus do for this child? He doesn’t order the child to do anything, but rather, embrace the child! He holds the child! He expresses affection and love, and nothing else! And in doing so, he exposes the third scarecrow, in saying that as disciples, they need to accept even the very least if they are going to be faithful servants. The word “all” makes no exclusions. Be servants of all, and welcome all, even someone as unimportant as this child, because in doing that, you welcome him into your heart, and not just Jesus but the one who sent Jesus, God the Father. Why would they be afraid of this though? Because they were afraid of welcoming in general, because in opening one’s self to others, you risk getting hurt emotionally. Welcoming others is a dangerous thing, but that’s part and parcel of being a disciple. And so the third scarecrow is exposed: the disciples are afraid of welcoming the least of these. One by one, Jesus demolishes the straw men, the scarecrows in their hearts, the decoys of fear, the monsters in the closet that are really insubstantial in the end. Jesus ends our fears. Don’t be afraid to ask questions. Don’t be afraid to accept the death of Christ as a reality. Don’t be afraid to give up power, and to serve all. Don’t be afraid to welcome the least of these. We don’t need to be afraid of these things. These are the tasks we are given as disciples of Christ, and as people of the Word. We no longer have to be afraid of the scarecrows that haunt us. They aren’t worth getting afraid over. They aren’t worth being paralyzed over. They are completely unsubstantial, completely fake, completely made of fluff, made to look scarier by our own doing, even though they are harmless. These scarecrows exist, I think, in not just the disciples hearts, but in our own hearts too. We’re afraid of all these things, afraid of being wrong, of accepting death, of being powerless, and of being hurt in accepting others. We all have these fears, but we don’t need to be afraid. Jesus can get us past these fears, and give us the courage to overcome them and become better followers, better disciples. Faith can overcome even the most intimidating of scarecrows. In the words of Joshua, “Be strong and courageous, do not be terrified, do not be discouraged, for the Lord will be with you wherever you go.” Or in the words of Paul in Philippians: You can do all things through him who gives you strength. Christ can help you overcome your fears, because really, nothing is a match for the power of Christ. We must ask questions. We must be servants of all. We must welcome the least of us in our community, without reservations. When we do those, those scarecrows in our hearts are exposed, and torn down, and all that’s left is the cross of Christ, and the truth of the messiah. Thanks be to God for the strength to overcome fear, that Christ alone gives us. Amen. This entry was posted in Uncategorized and tagged Batman, Christianity, Discipleship, Fear, Religion, scarecrows, Sermon. Bookmark the permalink. Thank you for this. I needed to hear this today. The Lord is calling me to go into full-time ministry, to follow Him into the nations. And even though I know clearly it’s where He’s calling me and that He’ll be with me, I’ve been experiencing an full-feldged fear attack the last few days. I’ve been so caught up in the what-ifs: what if my support doesn’t come in? What if people find out that I, someone called to be in consecrated leadership still *gasp* sin? What if I’m not as connected to God’s heart as I know i need to be? What if, what if…. And all that He requires is that I’d come to Him as simply and wholeheartedly as a child, that I would recognized my weakness and trust in His strength and provision despite it. BLESSINGS. I’m going to follow you. Thanks Kaylee! I pray that God will be with you as you enter into ministry!